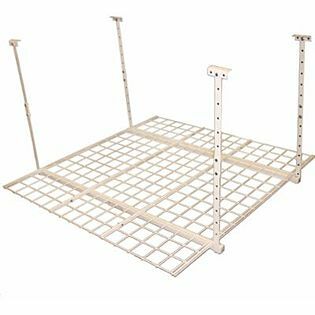 This is the summary of consumer reviews for HyLoft 540 45-Inch-by-45-Inch Overhead Storage System. The BoolPool rating for this product is Excellent, with 4.50 stars, and the price range is $50.00-$64.00. The HyLoft 45-by-45-Inch Overhead Storage System makes the most of unused overhead space in garages, attics, closets, storage rooms while keeping the clutter away. It is an ideal way to store large, bulky items with this durable and innovative ceiling storage system that has a capacity of up to 250 pounds and includes all the hardware needed to mount in any room in your house. 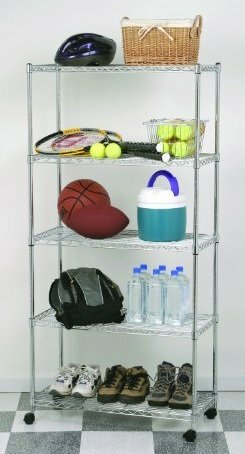 This simple to set up storage shelf is designed for easy access and frees up valuable floor space by providing a convenient and safe place to store your stuff. It is made of powder coated steel and has a storage capacity of over 30 cubic ft. 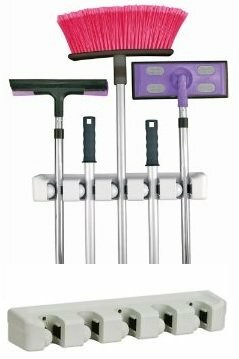 It easily adjusts in height from 16" to 34" and the assembly and ceiling attachment takes just minutes and gives you a wide range of storage options. The HyLoft has an attractive, scratch-resistant finish and is made of durable steel. 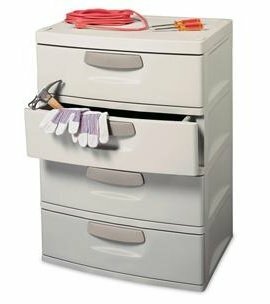 The wire design provides access to your items from the front, back, and sides. It lets you customize your installation according to the dimensions of your room or your storage needs. So whether you have a basement with a small head clearance or a garage with 10-foot ceilings, the Hyloft has you covered. And since the stored items aren't concealed, you'll be able to find the items you need with a quick glance instead of digging through all your boxes. If you need even more space, you can install multiple HyLoft units together for greater storage capacity and arrange them in various patterns to accommodate corners and other layouts. Users like that the HyLoft is designed for a single person to install quickly. It can be mounted on both finished and unfinished ceilings, and all the hardware needed for installation is included. Some reviews have pointed that the wire grating is a little thin, and certain boxes could get stuck on the sections where the grating overlaps. Overall, the Hyloft overhead storage is easy to install and adjusts to the needed height. It does a great job of utilizing overhead space in the garage. 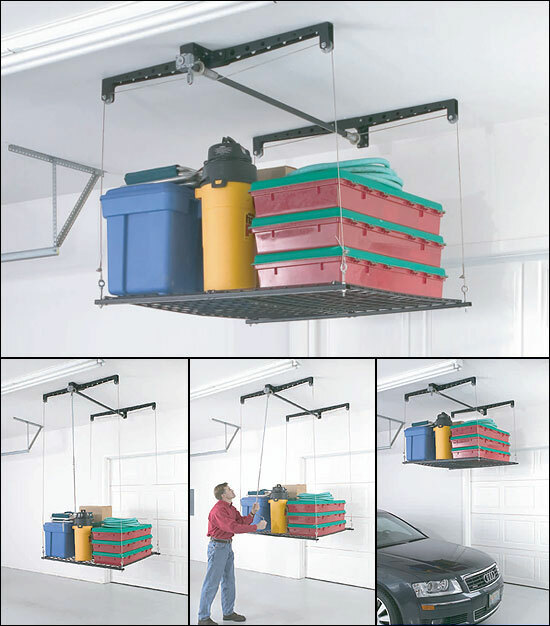 It is an ideal version of the overhead storage solutions for anyone who needs to take those towers of boxes off the garage floor and finally park their car in their garage. These are sturdy, simple, completely functional and affordable. Note: Available in other colors and sizes too. Easy to install with straight forward instructions. the hyloft was very easy to install. High quality, well packaged, well documented, easy to follow instructions, and yes, you really can install it by yourself, (for me in about 44 minutes each, and I installed 4). Installation was quick, easy and can be done by one person. Easy to install and the white color blends in with the ceiling. It was relatively easy to install, but it's smaller and offers less space for storage than I expected. This's 3rd unit purchased and installed. A very good product with well written instructions. Instructions could have been slightly clearer, but box packaging and installation hardware (screws, etc.) were laid out perfectly. Gived me a solid shelf that was well supported and relatively easy to install. This company has an excellent product. The install process is very easy and the company definitely backs up their product. It's sturdy, instructions were good and it holds content well. I installed two, the second one installed in one forth of the time once I got the "hang" of it!. Top notch product, top notch manufacture that believes in their product, and top notch customer service!!! The end product is handsome, strong, and holds a great deal of stuff. Have several units in garage. 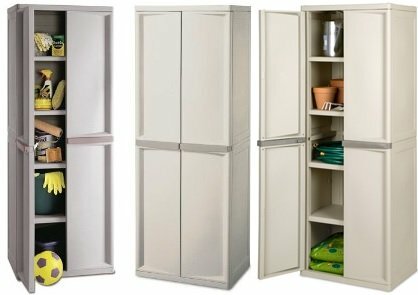 I ordered four of these units to get more space into my garage/workshop. I've purchase 7 units for my garage. 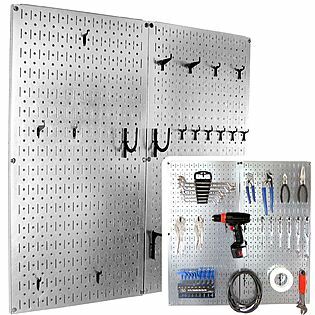 We ordered two units and along with our two Mica/Charcoal Four-Shelf, Double-Door, Heavy-Duty Storage Cabinet (RHP7083) units they've made a significant improvement in the organization of the 'my workshop/our garage' space that we share. My husband wanted to put four of these hanging units in our garage for the extra space we needed for storage. 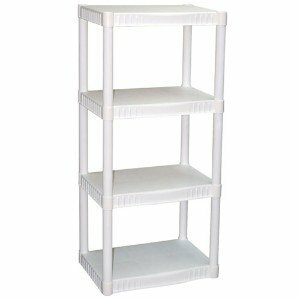 These units are very sturdy and give you extra hanging storage space that most of us need. The mesh shelves themselves are nice, seems just as sturdy as my other wire shelving unit in the garage. After installing all 5 of the units, they looked great. It's time consuming to put up four units, but when all is said and done, we've the much needed space in our garage. The unit is well made and versatile. Noticed lots of room in the garage, especially over garage door (11 ft ceilings). We've a high ceiling in our garage which amounted to a lot of wasted space which I needed to store large wreath boxes and Christmas decorations. Got alot of stuff off the garage floor with this product. That's 5 x 12 boxes or 60 boxes total storage! No extra purchases needed from the big box stores. These were easy enough for my husband to set up by himself in the garage and they hold a ton of stuff. I can pretty much store all of my wife's christmas stuff up there. I now have 400lbs of stuff I should have just thrown away neatly stored overhead in my garage. I was able to store a good amount of various sized boxes on the unit. As I need to store more stuff, I'll definitely buy another one of these racks. Apparently, I've a low garage ceiling and support bars can't be shortened enough (without physical alteration) to suspend above opened garage door. 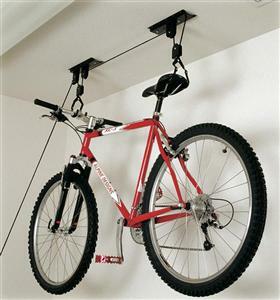 I purchased two of these racks to utilize space over my garage door. Easy to install (took about 20 minutes) and adjust to the needed height, and it does a great job of utilizing overhead space in the garage. They fit perfectly over my automatic garage door (you can adjust the height). The only problem I've is I couldn't use all the possible space because my garage door opens and leaves me only enough space to put this product on its highest setting. Also, don't push the limit of height before it hits the garage door opener. It didn't take very long to install two of these in my garage. I feel like building a second large garage just to install about 12 of these. It's easy to assemble (with all parts included) and able to provide allot of additional storage space in an unused portion of the garage.